In the late summer and early fall of 1944, at the height of the Second World War, a series of important diplomatic meetings took place at Dumbarton Oaks. Their outcome was the United Nations charter that was adopted in San Francisco in 1945. 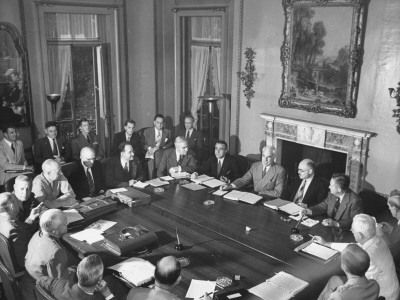 At these meetings, officially known as the “Washington Conversations on International Organization, Dumbarton Oaks,” delegations from China, the Soviet Union, the United Kingdom, and the United States deliberated over proposals for the establishment of an organization to maintain peace and security in the world. The chairs of the respective delegations were Andrei Gromyko (1909–1989), the Soviet ambassador to the United States; Cordell Hull (1871–1955), the U.S. secretary of state; Wellington Koo (1887–1985), the Chinese ambassador to the United Kingdom; and Edward Wood, the earl of Halifax (1872–1959), the British ambassador to the United States, each of whom chaired his respective delegation. Chinese delegation, second phase of the Dumbarton Oaks Conversations, together with the American and British delegations. Photo: National Archives, Washington, D.C., September 29, 1944. The conversations were held in two phases. The first, between August 21 and September 28, involved representatives of the Soviet Union, the United Kingdom, and the United States. The second, between September 29 and October 7, brought together representatives of China, the United Kingdom and the United States. Since the Russian and Chinese delegations could not meet at the same time and at the same place, the organizers took pains to hold the talks with the Chinese delegates at the same place where the conversations with the Soviet cohort were held. to afford a center for harmonizing the actions of nations in the achievement of these common ends. The delegates agreed on a tentative proposal to meet these goals on October 7, 1944. In his Witness to History, 1929–1969 (New York, 1973), C. E. Bohlen observes that “Dumbarton Oaks settled all but two issues regarding the organization of the United Nations—the voting procedure in the Security Council and the Soviet pressure for the admission of all sixteen of the Soviet republics to the General Assembly. It took the conference at Yalta, plus further negotiations with Moscow, before the issues were solved” (p. 159). Informal meeting in the Study at Dumbarton Oaks. 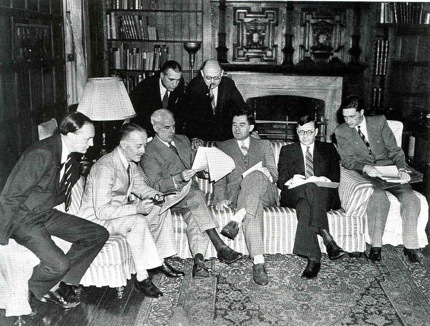 Seated (left to right): Peter Loxley, Sir Alexander Cadogan, Edward R. Stettinius Jr., Andrei A. Gromyko, Arkadii A. Sobolev, Valentin M. Berezhkov. Standing (left to right): James Clement Dunn and Leo Pasvolsky. Photo: National Archives, Washington, D.C., 1944. British delegation meeting in what is now the Director's Office at Dumbarton Oaks. Robert Woods Bliss (1875–1962), who with his wife, Mildred Barnes Bliss (1879-1969), had given Dumbarton Oaks to Harvard University in 1940 to establish a scholarly research institute and museum in Byzantine studies, was instrumental in arranging these meetings. Already in June 1942, on behalf of the director, John S. Thacher, and the Trustees for Harvard University, he had offered to place the facilities of Dumbarton Oaks at the disposal of Secretary of State Cordell Hull. When the State Department found that Dumbarton Oaks could “comfortably accommodate” the delegates and that “the environment [was] ideal,” the offer was renewed by James B. Conant, the president of Harvard University, in a letter of June 30, 1944. The State Department accepted the offer in large part because the alternative venues had “unattractive” rooms in comparison to the sophisticated interiors of Dumbarton Oaks. Dumbarton Oaks also was situated at the heights of Georgetown, one of the coolest locations in Washington, D.C., a major consideration given the hot and humid summer weather and the rarity of air conditioning at the time. The size and layout of the rooms at Dumbarton Oaks were appropriate for seating the number of people and installing offices as necessary, and the estate's relative isolation offered the privacy and security needed for these unofficial talks. In order to host the discussions and make visiting delegates feel comfortable, the Main House at Dumbarton Oaks had to undergo some minor adjustments. During the course of the conversations, the Music Room was temporarily renamed the Assembly Room, the Orangery served as a cafeteria for buffet luncheons, and a signed photograph of Polish pianist Ignacy Jan Paderewski, which sat atop the Steinway concert grand piano, was removed for fear that it would ignite conflict with the Soviets. Members of the American delegation at luncheon on the Orangery terrace at Dumbarton Oaks. Photo: Special Collections Department, University of Virginia Library, 1944. American, British, and Soviet delegates to the first phase of the Conversations assembling for a group photograph on the North Vista at Dumbarton Oaks. Photo: Stettinius Papers , Special Collections Department, University of Virginia Library, April 21, 1944. For the purposes of the conversations, security at Dumbarton Oaks was increased considerably. Military police were stationed at the main gates and monitored the estate. Cars had to be removed from the premises, and an intricate pass identification system was installed so that the military police would be able to monitor the movements of all on the property. Cartoon by S. J. Ray, Published in the Kansas City Star on August 1, 1944. With enduring peace at stake, all steps were taken to increase the likelihood of success. It was hoped that by holding the informal conference in the luxurious and well-maintained Dumbarton Oaks, delegates would be more apt to engage in discussions of global harmony and security. Thus, the tranquility of those in attendance was a major consideration throughout the proceedings at Dumbarton Oaks. The success of the Dumbarton Oaks Conversations can be measured by the prompt formation of the United Nations, an organization founded just over a year later. Consisting of fifty-one member nations at its creation, the United Nations pledged to devote itself to the liberation of future generations from the devastation of war, the protection of human rights, and the promotion of justice and social progress. The conversations and agreements at Dumbarton Oaks directly fostered the formation of this cooperative international body. For further information on the Dumbarton Oaks Conversations, see Robert C. Hilderbrand, Dumbarton Oaks: The Origins of the United Nations and the Search for Postwar Security (Chapel Hill and London, 1990). A newsreel video of the Conversations, "Dumbarton Oaks Conference: Allies Study Post-War Security," can be found here.